Located in the centre of Pineda De Mar the hotel is only 40 metres from the beach and 150 metres from the shops. Access to the beach is via an underground tunnel that is suitable for wheelchairs and prams. The 40 rooms have air conditioning, balcony, telephone and satellite TV. Sea view rooms are available. Stayed in Pineda 3 times but would not go back to Sorrabonna appartments they are clean but very basic. On arrival at Sorrabona hotel you are asked for 100 euros for any damages etc, if thats not bad enough you have to wait in your room at a specified time on your day of departure, this is so that a supervisor can come and check everything, I felt like a naughty schoolgirl. You can use the facilities at the hotel which is only across the way, but if you had little ones who are always wanting in and out of the appartments this could be a pain.The pool is freezing, and we were there in August, kind of situated in a wind tunnnel position right next to the promenade. We didn't bother going to the Sorrabonna hotel in the evening, but from what we saw there wasnt much to bother going for. 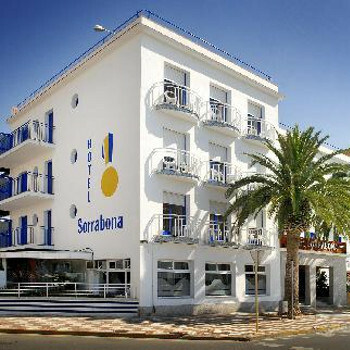 I would say that if you do stay in Pineda, yes try the Sorrabonna hotel but not the apartments. I did check out the 'comfort' rooms,they are large look comfortable and spotless, although could be a squeeze if you got kids.